Yes, there is an element of geologic plausibility in those "Native of Tropical Montana" bumper stickers. If you go back far enough in time, Montana has had periods of tropical climate; volcanoes; glaciers; catastrophic flooding from breached, glacially-dammed lakes; large, bipedal, carnivorous dinosaurs, entire mountain ranges that slid across the landscape; and other conditions that you probably wouldn't expect, based on today's landscape. However, most of that is another story. This page focuses on the parts of Montana's geologic past that were significant in the formation and distribution of Montana agate. Montana agate is made of silica (SiO2), and the attractive inclusions consist of iron, manganese, and other minerals. The formation of Montana agate is intimately related to the occurrence of silica and color-producing minerals in Montana's past. Volcanic material (lava flows, ash, etc.) is a common source of silica for agate formation. The silica content of lava ranges from relatively-low (basaltic lava) to relatively-high (rhyolitic lava). Rhyolite lava is thicker (more viscous) than basalt lava, and rhyolite volcanoes (such as Mount St. Helens) may be much more explosive than basaltic volcanoes (such as Kilauea on the island of Hawaii). Much of the volcanic activity in Montana and the super-massive, explosive Yellowstone volcanoes were rhyolitic, or high in silica content. Silica is slightly soluble in groundwater at ambient temperature and pressure conditions. If silica is present in intact, relatively unfractured rock, then the rate of dissolution of silica from the rock will probably be relatively low. Much of the Montana-Yellowstone volcanism was of the explosive, rhyolitic variety, and resulted in the deposition of fine volcanic ash over extensive land areas. Volcanic ash has a high ratio of surface area to weight and, as a result, volcanic ash can react very readily with circulating groundwater to liberate silica and other minerals. Finally, small changes in temperature, pressure, and/or micro-scale geochemistry can cause silica (and other minerals) dissolved in groundwater to precipitate out of solution. Agate is porous and may contain an appreciable amount of water ..... when precipitation of minerals occurs within an evolving Montana agate, the result may be colorful inclusions or else "healing" of cracks in the agate matrix. ~ 80 million years ago The last major tectonic period that completed the uplift of the Rocky Mountains. ~ 50 million years ago The Absaroka volcanic center in southwest Montana is active, and results in ash/mud flows, and burial of organic matter. Today, petrified wood is commonly found in the in-situ (i.e., not transported after deposition) geologic strata that date from this period. ~40 million years ago Montana enters into a period of dry climate. An interesting feature of the dry periods in Montana is that precipitation likely consisted of infrequent, intense storms. These energetic storms helped to move gravel deposits eastward from the toe of the Rocky Mountains onto the western Great Plains. ~20 million years ago Montana enters a tropical climatic period, with the formation of lateritic (iron-rich) soils. ~10 million years ago Montana again becomes dry. Again, infrequent, intense storms move immense gravel deposits eastward from the toe of the Rocky Mountains onto the western Great Plains. The 6-Mile Creek and Flaxville Formations are present-day, distinct, mappable gravel strata that contain Montana agate, and which date from approximately 10 million years ago. ~2.5 million years ago Montana experiences glaciation, which contributes to the establishment of the present-day stream system. ~2 million years ago Several periods of super-massive volcanic activity occur in the Yellowstone Park area, with heavy ash deposition over thousands of square miles. The heaviest ash deposition is closest to Yellowstone Park. Very little published, scientific investigation has been directed at the origin and distribution of Montana agate. One of the earliest analytical tools in geology was the recognition that individual rock strata may have distinctive, recognizable characteristics (such as fossils), and the occurrence of these rock strata may be mapped over a large land area (see "The Map That Changed The World" in Links & Resources). If a recognized (i.e., studied and with known characteristics) rock stratum is found in a new area, one may be able to deduce the relative age of the rock stratum based upon its position in the vertical rock sequence (stratigraphic position). Montana agate is not generally found in the location or in the rock stratum in which the agate formed, and does not contain fossils, so we can't date Montana agate by its position in the stratigraphic sequence. Another early tool in geology (and in deductive logic, in general) is the principle of Occam's Razor, which states that "the simplest explanation that adequately addresses all of the facts is usually the correct one". To apply Occam's Razor to the origin and distribution of Montana agate, we need to start by tracking Montana agate backwards in geologic time. In addition to being found in recent deposits along the Yellowstone River, Montana agate is also found in gravel deposits (6-Mile Creek and Flaxville Formations) that have been reliably dated to about 10 million years ago. Therefore, Montana agate must be at least 10 million years old. This also means that the super-massive volcanic explosions at Yellowstone Park that occurred up to about 2 million years ago didn't directly contribute to the original formation of Montana agate. The agate that is found in the River today was most likely washed into the river from the adjoining, upland or plateau gravel deposits. An interesting side note on the Flaxville Formation is that, to the south, gravel deposits of the same age are known as the Ogallala Formation, and these gravels host the most productive water supply aquifer in the Great Plains from Wyoming to Texas. Everywhere you look, gravels of roughly this age were transported from the eastern slopes of the Rocky Mountains out onto the Great Plains...... however, Montana agate is generally found only in the Yellowstone River basin. One difference between the Flaxville gravels and the Ogallala gravels is in the differences in the drainage basins in which these gravels are found. 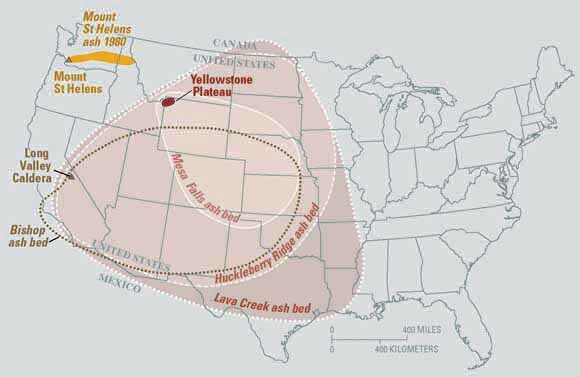 The Yellowstone and Missouri rivers formerly flowed north into Canada. The relatively recent glaciation caused damming of the Missouri, resulting in nudging its channel to its present-day, more southerly course. So, prior to the emplacement of the 6-Mile Creek and Flaxville gravels, what was happening in Montana ? Approximately 20 million years ago, Montana was in the midst of a tropical period, during which distinctive, tropical soils (laterites), enriched in iron and other minerals, were formed. The formation of Montana agates probably didn't begin before this time. Approximately 40 million years ago, Montana was in another dry period. Infrequent, intense storms carried gravel deposits (Renova Formation)eastward from the eastern toe of the Rockies. Montana agate isn't reportedly found in these deposits, so the the erosion that moved these gravels probably either a) worked on strata that are higher (younger) than the strata in which Montana agate originated and/or b) acted across a different elevation gradient than existed during the placement of the 6-Mile Creek and Flaxville gravels, and/or c) diagenetic changes (changes in rock that occurs after the rock is formed, such as alteration by minerals in groundwater) may not have occurred the same way within the Renova gravels and the Flaxville gravels. 50 million years ago, the tectonic activity and uplift that created the Rocky Mountains was coming to a close. At the same time, the Absaroka volcanic center was active in southwestern Montana (just east of the present-day location of Yellowstone Park), causing widespread ash deposition and ash/mudflows. In places where the Absaroka ash deposits can be observed in-place today, petrified wood is common...... evidently, the Absaroka ashfall buried appreciable stands of vegetation in silica-rich ash-fall. In terms of the simplest explanation that fits the facts, the Absaroka volcanism seems to fit the bill for the event that began the formation of Montana agate. In the millennia since the Absaroka volcanism, incipient Montana agate has been transported down the evolving Yellowstone River basin and across the northern Great Plains and High Plains physiographic provinces. Today, Montana agate is found in Yellowstone River gravels from near Emigrant, MT (Yellowstone River near the Wyoming-Montana border, at the western border of the Absaroka volcanic center) to the Montana - North Dakota border. The older, in-place deposits, such as are found in the Flaxville gravel benches and plateaus mostly to the north of the Yellowstone River Valley, contain agates that may have the distinctive, red banding and black dendrites, but these upland agates may be more checked and cracked than the agates that are found along the River. The upland agates may also be covered by a distinctive, bluish-white crust that seems to develop on agates that are exposed to the weather. This crust is similar in appearance to the crust that develops on volcanic-origin agates in other locations in the volcanic, Pacific northwest (and elsewhere). Agates found in the River often lack the crust, whose formation is evidently inhibited or prevented when agates are tumbled along the streambed. Agates that are found in and along the River are more likely to be unchecked or cracked, or else you can see evidence of cracks that have healed. Many people would say that the best lapidary-quality Montana agate comes from along the River. The Yellowstone River shows abundant evidence of highly variable, geochemical micro-environments....... periodic variation of the water table surface, mineral-rich groundwater seeps (the Terry, MT Badlands are a great place to see this), and the annual slug of silica-rich volcanic ash/soil in the river each spring. These micro-environments likely contributed significantly to the unique, distinctive appearance of Montana agate........more about this in the page on inclusions.